Dimensions: 15.5" (L) x 4" (W) x 11" (D) Main 8" x 6" x 1.5" Frontal (long pocket) 3.5" x 3.5" x 1.5" Frontal (2 small pockets) 7" x 5" x 1.5" Frontal (wide pocket) 14" x 10" x 1.5" Rear Organizer Pocket Radio Pocket: Fits most radios, sat phones, GPS Main Compartment: Fits up to 15.4" (diagonal screen size) laptop computer Water Bottle Pocket: Fits 32oz / 1L Nalgene Optional accessories: Hook & Loop Modular Accessories Colors: Black / Green / Khaki / Digital Foliage Camo New for 2006, the Maxpedition Operator Tactical Attache (#0605) is a large tactical computer attach, fully padded on all sides, and sized to fit a 15.4" (Diagonal Screen Size) laptop, and a legal size pad. This is the perfect office go-bag for the Tactical Officer. On the front side of the pack, four (4) separate pockets of varied shapes and sizes hold and organize your smaller pieces of gear. The largest pocket has internal and external sleeves for increased capacity, plus an ID window. Between the collage of pockets and the main compartment is a CCW compartment, lined with loop-side Velcro for attachment of our #3501 Universal CCW Holster and our #3502 Three-Clip Holder, and large enough to conceal a full size handgun and 3 spare mags. On the opposite face, a fully padded organizer opens up as a document/tool/instrument pocket with extensive internal divisions. On the ends, there is a radio pocket and a water bottle pocket, both with bungee retention. Velcro loops on top of bag can retain a collapsible baton or a flashlight. On the bottom, rubberized material keeps the bag waterproof and non-slip. 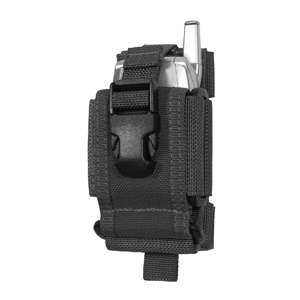 The #0605 Operator Tactical Attache can be hand-carried and comes with a padded shoulder strap. Main zipper pull features our button lock safety device, to prevent accidental opening. Available in Black (#0605B), Green (#0605G), or Khaki (#0605K).